A boy and his dog face off against a horde of zombie gorillas in this action-packed adventure by debut author Todd Nichols, a 3rd grade teacher in Massachusetts. Peas and Hambone is a story about a 10 year old boy named Peas and his talking dog Hambone. What’s great about Hambone is that he’s witty, snarky, and not afraid of anything –including evil Doctor Crazy Gorilla, a mad scientist trying to take over the world by creating an army of flesh eating zombie gorillas. Its not easy, but eventually Peas and Hambone come up with a plan to stop Evil Doctor Crazy Gorilla and save the world. A clever series starter sure to leave readers wanting more Peas and Hambone adventures. I absolutely loved everything about this book. What Todd Nichols does is take every thing that kids from the ages of 4-14 and make it funny. Hell forget until 14. I thought this book was witty, smart and incredibly good. Peas and Hambone are the stars of this story. Peas or Peter is basically a 10 year old boy who spends all his time with his best friend, his dog Hambone. Hambone is a character and a half. He is almost too much character for a children's book but if your child likes Adventure Time or Captain Underpants they will be fine! Honestly I have to admit, I read this story in the voice of Finn and Jake. OK, back to the review. Hambone walks and talks like his boy Peas (lets not even discuss why his nickname is peas, I want to keep it a surprise) but it all begins when Hambone decides to get back at a gorilla who he says threw dirt at him. Our stars break into the zoo and the next thing you know all hell breaks loose and burglars suddenly find themselves heroes of humanity. With gorillas turning into zombies and a gang of bikers who don't use real weapons, the zoo is a real mess and Peas and Hambone need to work together with a bunch of misfits to stop the zombie gorillas and bring the zoo back to normal. The story is hysterical. There are some really good zingers that will make you smile if not laugh out loud. The absurdity to this story is what really makes it a fun read. 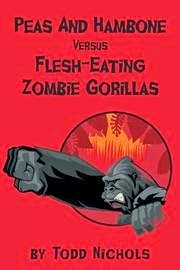 If you buy your kid one book this year, make it Peas and Hambones Versus Flesh Eating Zombie Gorillas! The question is Mr. Nichols will there be more? Please say yes! The place people convey budget together with systems, any rolex replica uk convey the regional know-how together with being able to beat governmental affirmation blocks. Someone what person says they need the required steps in the form of replica chanel bags sale together with whatever complements for a version, whether or not they're just male or female, have to make a call to a good modeling agent. A good modeling agent may be a provider that could be ready speak for way brands together with allow them to have any fake rolex watches that they need in an effort to job during the way community. There does exist an individual certainty: absolutely nothing zero cost in this world. Which means that usually do not hope these businesses to the office without charge also. Yet, these sorts of replica gucci sale come up with your experiencing by just money making " transaction fee ", for the most part within the bargain these constructed former when using the version. The majority very best services, during replica chanel handbags or simply somewhere else worldwide, handle well recognized together with ripped advertisements services obese really good way creators.